Over at Wired, Macworld alum Brian Chen has an interesting piece on how the iPhone app store might be affected by apps in the future. 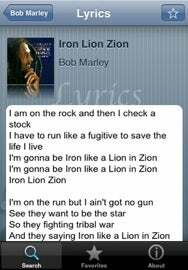 The story concerns the iPhone app Lyrics, which was rejected from the App Store because the songs for which it displayed lyrics might contain profanity. Developer Jelle Prins subsequently added a "profanity filter," and the app was approved upon resubmission. However, Prins also added in something a little extra: an Easter egg that could reveal the profane lyrics if the user so desired. Here's how to make it happen: in the Lyrics app, go to the About page, swipe downward thrice, and select the option to turn off this filter. The article goes on to argue that malicious apps could take photos without the user's consent, record sound, or even somehow steal address book contacts. While this is true, there seem to be no real-world examples of this just yet—but it does make me wonder what percentage of iPhone apps actually do have Easter eggs squirreled away inside of them. While far be it from us to recommend this as an avenue for sneaking past the App Store's approval process, it could potentially be helpful in the face of bizarre and byzantine restrictions (though if you get caught, the consequences might be even worse).